Kevin East Joins The Jersey Knights Staff ! Coach East has brought the program to back-to-back ECAC Metro Championship playoff berths (2008 and 2009) and coached the program to its first-ever appearance in the New Jersey Athletic Conference Men’s Soccer Championship Tournament (2009). In three short seasons, the Scarlet Raiders have developed into a threat within the rugged NJAC, going 4-3-2 in 2009 and winning their opening round playoff match against Richard Stockton, 1-0 in overtime, before bowing to four-time league champion Montclair State in the semifinals. The Raiders won a school-record 13 matches in 2009. With a record of 32-25-7 at Rutgers-Newark, he finds himself just eight wins short of becoming the winningest coach in program history in only three seasons. His 55.5 winning percentage is the best on the Raider books. Player development and performance has also become a trademark with honors coming and records falling a frenetic pace. For the first time in program history, two Rutgers-Newark players – senior sweeper Luis Valle and junior midfielder Estiven Benitez – were named to the All-NJAC first time in the same year. The Raiders led the NJAC in points, goals and shots in 2009 for the first time in program history while junior goalkeeper Matt Zielyk led the 10-team league with nine shutouts. Twelve team shutouts were a program record as the Raiders yielded just .90 goals per game. In his first season at the helm, he led his young squad to its best finish in a decade while beginning to expand the Scarlet Raiders’ recruiting reach. The 2007 squad finished 9-10-1 with five one-goal losses to narrowly miss the first winning season for the program since 1997. In 2008, East guided a young Raider squad which carried just three seniors in its ranks to a 10-9-2 mark – and to the school’s first ECAC Metro Championship title match. Rutgers-Newark, which had fallen in the opening round of the ECAC Championship in its previous trips in 1989 and 1996, gained its first post-season victory ever with a 6-1 win over Baruch before shocking New Jersey City in a shootout round, 3-2, to advance to the championship match following a 3-3 double-overtime tie. No. 22 nationally ranked William Paterson needed a shootout round to take the ECAC Metro crown after Rutgers-Newark battled the heavily-favored squad to a 1-1 stalemate through two overtime periods. The newly created director of soccer operations position allows East to oversee both the men’s and women’s soccer programs, raise the Scarlet Raider men’s program to a competitive level within the New Jersey Athletic Conference, and develop full usage of the soccer facilities at Rutgers-Newark. He has helped draw attention to the program by playing an indoor exhibition match in the spring of 2009 at the newly-opened Prudential Center and by bringing local clubs and organizations to Alumni Field. The Skillman, NJ, native developed the NJCU program from cellar-dweller to perennial playoff contender during a nine-year stint. Taking over the Gothic Knight program as a part-time coach in 1998, East posted a 123-66-11 record which included posting 17 wins in three of the last four seasons. He coached NJCU to its first NCAA Championship Tournament berth in 2005. In 2007, the Gothic Knights reached the ECAC Metro Men’s Soccer title match and had five players listed on the All-New Jersey Athletic Conference roster. The 39-year-old coach has completed work for a National “A” Coaching License from the United States Soccer Federation, putting him on the highest level of coaches in the country. He also has a Director of Coaching certificate from the National Soccer Coaches Association of America and is an active member of the group’s National Rating Board. He also has coached and instructed in the Olympic Development Program and is the former president of the College Soccer Association of New Jersey. At Kean, East was named the Defensive Most Valuable Player for the final four as Kean claimed the 1992 NCAA Division III Men’s Soccer Championship. The three-time first-team All-NJAC goalkeeper still holds the Cougar record with 29 career shutouts for his mentor and legendary coach Tony Ochrimenko. The Cougars went 61-16-2 during his three seasons as starting keeper, reaching the NCAA Tournament each year. East was drafted by the Columbus Crew in the inaugural season of Major League Soccer in 1996, and he served as back-up goalkeeper for the Metro Stars in 1998 and 1999. He started in goal professionally in the United Soccer League for the Jersey Dragons (1994-95), the Central Jersey Riptide (1996-97), the New Jersey Stallions (1998), and the North Jersey Imperials (1999). At Montgomery High School, East was an all-state, All-Somerset County and All-Skyland Conference keeper who helped his team to a Central Jersey state sectional title. After earning a bachelor of arts in political science and criminal justice from Kean in 1993, East began his coaching career as an assistant for Ochrimenko for four seasons. The 1997 Cougar team went 20-2 and did not give up a goal in any of nine NJAC matches for the only time in conference history. Griffin and East worked together from 1999 to 2004 at NJCU, developing a strong working bond. 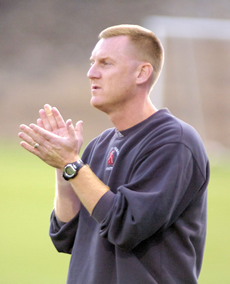 One of the key pieces remaining in the continued development of the Scarlet Raider athletic program since Griffin took the helm in August of 2004 is improvement of the men’s and women’s soccer programs. A new FieldTurf surface on Alumni Field was finished in September of 2007. Now the men’s soccer program, which has struggled under part-time head coaches in the brutally competitive New Jersey Athletic Conference, has a proven program builder in charge.